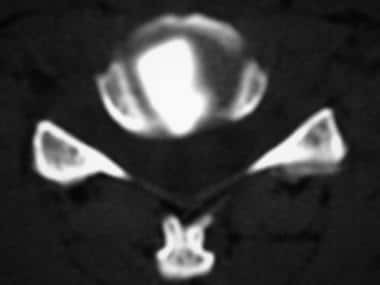 Sagittal magnetic resonance imaging (MRI) scan demonstrating cervical intervertebral disc protrusions at C3-C4 and C7-T1. Understanding cervical disc disease requires basic knowledge of anatomy and biomechanics. The intervertebral disc is a functional unit connecting 2 vertebral bodies of the spine. The disc absorbs shock, accommodates movement, provides support, and separates vertebral bodies to lend height to intervertebral foramina. The disc consists of 3 structural components; an eccentrically located nucleus pulposus, a surrounding lamellar annulus fibrosus, and 2 cartilaginous endplates, separating each segmental level between the C2-T1 vertebrae. No disc exists between C1 and C2, and only ligaments and joint capsules resist excessive motion. 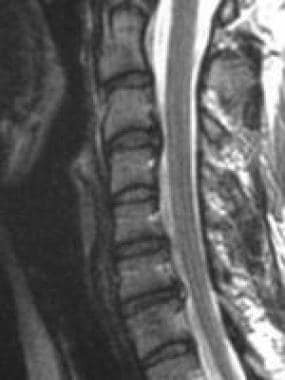 Disc degeneration and/or herniation can injure the spinal cord or nerve roots and result in stenosis  and/or myofascial pain. Consider performing rheumatologic workup to evaluate for possible rheumatoid arthritis, ankylosing spondylitis, Reiter syndrome, and polymyalgia rheumatica. In addition, consider performing infection workup to evaluate for possible discitis, epidural abscess, and vertebral osteomyelitis. Plain cervical spine radiographs are used to evaluate chronic degenerative changes, metastatic disease, infection, spinal deformity, and stability. Computed tomography (CT) scans delineate cervical spine fracture and are used extensively in trauma cases. A myelogram followed by a CT scan may be obtained prior to cervical decompressive spinal cord or nerve root surgery. This study evaluates the spinal canal, its relationship to the spinal cord, and nerve root impingement from disc, spur, or foraminal encroachment. Magnetic resonance imaging (MRI) remains the imaging modality of choice to evaluate cervical HNP, due to its low morbidity. [5, 6] Advantages include soft-tissue definition (eg, cervical discs, spinal cord), cerebrospinal fluid visualization, noninvasiveness, and lack of patient radiation exposure. Provocative discography is the only procedure that can determine whether a disc serves as the pain generator. Discomfort and invasiveness render this procedure less desirable than cervical MRI, which provides much of the anatomical information that provocative discography does. Electrodiagnostic studies continue to be standard for evaluating neurologic function of the cervical spine. Advantages of these tests include limited expense and low morbidity. For most cervical disc disorders, studies support conservative treatment, such as the McKenzie approach and cervicothoracic stabilization programs, combined with aerobic conditioning. Physical modalities should be used to reduce pain only in the acute phase. Once past the acute phase, modalities are used sparingly on an as-needed basis. Cervical traction may relieve radicular pain from nerve root compression. Traction does not improve soft-tissue injury pain. Hot packs, massage, and/or electrical stimulation should be applied prior to traction to relieve pain and relax muscles. A soft cervical collar is recommended only for acute soft-tissue neck injuries and for short periods of time (ie, not to exceed 3-4 days' continuous use). Spinal manipulation and mobilization may restore normal range of motion (ROM) and decrease pain; however, no clear therapeutic mechanism of action is known. Cervical epidural, spinal nerve (or root), Z-joint, and sympathetic injections serve diagnostic and therapeutic roles. These procedures can be instrumental in determining the anatomic pain generator (eg, nerve root, facet) and providing aggressive, conservative treatment. Studies indicate that cervical HNP with radiculopathy can be managed conservatively. Surgery is warranted when neurogenic bowel or bladder dysfunction, deteriorating neurologic function, or intractable radicular or discogenic neck pain exists. Specifically, cervical spine surgical outcomes are most favorable for radicular pain, spinal instability, progressive myelopathy, or upper extremity weakness. The possibility of obtaining the goals of anterior cervical decompression and fusion (ACDF) while maintaining adjacent segment motion led to the advent of total disk replacement (TDR). 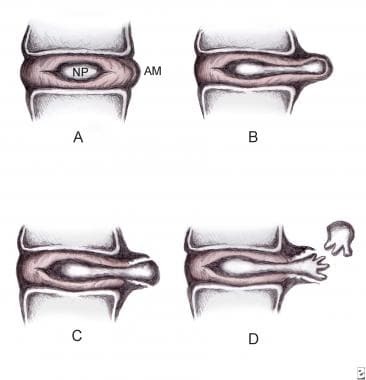 Manifestations of HNP are divided into subcategories by type (ie, protrusion, extrusion, sequestration). Disc bulge, is not a true herniation, per se. It is described as generalized symmetrical or asymmetrical circumferential extension of the disc margin beyond the margins of the adjacent vertebral endplates. Disc protrusion describes herniation of nuclear material through a defect in the annulus, producing a focal extension of the disc margin; it can further be defined if the greatest distance, in any plane, between the edges of the disc material beyond the disc space is less than the distance between the edges of the base, in the same plane. Extrusion applies to herniation of nuclear material when, in at least one plane, any one distance between the edges of the disc material beyond the disc space is greater than the distance between the edges of the base, or when no continuity exists between the disc material beyond the disc space and that within the disc space. Extrusion may be further specified as sequestration, if the displaced disc material has lost completely any continuity with the parent disc. The term migration may be used to signify displacement of disc material away from the site of extrusion, regardless of whether sequestrated or not. Examples of disc herniation are seen in the images below. Disc herniation classification. A: Normal disc anatomy demonstrating nucleus pulposus (NP) and annular margin (AM). B: Disc protrusion, with NP penetrating asymmetrically through annular fibers but confined within the AM. C: Disc extrusion with NP extending beyond the AM. D: Disc sequestration, with nuclear fragment separated from extruded disc. Axial magnetic resonance imaging (MRI) scan (C3-C4) demonstrating left-sided posterolateral protrusion of the nucleus pulposus with compression of the cerebrospinal fluid. Postdiscography axial computed tomography (CT) scan demonstrating right posterolateral subligamentous protrusion. Herniation typically occurs secondary to posterolateral annular stress. There are 2 main types of herniation that are described in the literature: focal and broad-based. Focal herniation involves less than 25% of the disc circumference, whereas broad-based herniations involves between 25-50% of the disc circumference. Herniation rarely results from a single traumatic incident. Acute traumatic cervical HNP serves as a major etiology of central cord syndrome. The C6-C7 disc herniates more frequently than discs at other levels. Acute disc herniation causes radicular pain through chemical radiculitis in which proteoglycans and phospholipases released from the nucleus pulposus mediate chemical inflammation and/or direct nerve root compression. Interleukin 6 and nitric oxide are also released from the disc and play a role in the inflammatory cascade. Denda et al has also recently showed that chronic compression of the spinal canal can lead to higher than normal levels of nitric oxide (NO) in the cerebrospinal fluid (CSF). Excessive NO levels have been shown to be cytotoxic and can induce neuronal apoptosis. Although high levels of NO have not been correlated to severity of pain or disease, this data may play a role in targets for future interventions. The chemical radiculitis is a key element in the pain caused by HNP because nerve root compression alone is not always painful unless the dorsal root ganglion is also involved. Herniation may induce nerve demyelination with resulting neurologic symptoms. Cervical HNP maybe resorbed during the acute phase. Indeed, studies documenting frequent herniation resorption and correlating herniation regression with symptom resolution support conservative treatment of cervical radicular pain. Cervical radiculopathy results from mechanical nerve root compression or intense inflammation (ie, chemical radiculitis). Specifically, nerve root compression may occur at the intervertebral foraminal entrance zone at the narrowest segment of the root sleeve anteriorly by disc protrusion and uncovertebral osteophytes and posteriorly by superior articulating process, ligamentum flavum, and periradicular fibrous tissue. Decreased disc height, as well as age-related foraminal width decrease from inferior Z-joint hypertrophy, may impinge subsequently on nerve roots. The cervical region accounts for 5-36% of all radiculopathies encountered. Incidence of cervical radiculopathies by nerve root level is as follows: C7 (70%), C6 (19-25%), C8 (4-10%), and C5 (2%). The most common cause of cervical radiculopathy is foraminal encroachment (70-75%). The cause is multifactorial, including degeneration of the discs and the uncovertebral joints of Luschka and the zygapophyseal joints. In contrast to lumbar spine disorders, HNP in the cervical spine is responsible for only 20-25% of radiculopathies. Cervical DDD most commonly is due to age-related changes, but the condition also is affected by lifestyle, genetics, smoking, nutrition, and physical activity. Degenerative disc changes observed on radiographs may reflect simple aging and do not necessarily indicate a symptomatic process. The disc begins to degenerate in the second decade of life. Degenerative disc disease is essentially a process disrupting homeostasis. This degenerative process of the less hydrated and more fibrous nucleus pulposus fails to withstand the compressive loading, resulting in uneven distribution of forces to the surrounding annulus, which leads to the formation of radial tears. Circumferential tears form in the posterolateral annulus after repetitive use. Several circumferential tears coalesce into radial tears, which progress into radial fissures. The disc then disrupts with tears passing throughout the disc. IDD describes pathologic annular fissuring within the disc without external disc deformation. This disorder results from trauma-related nuclear degradation, cervical flexion/rotation-induced annular injury, or whiplash. The intervertebral disc has few pain receptors and little innervation, except in the periphery of the disc. The intervertebral disc may not be irritated until the inflammation process becomes moderate or severe. The nucleus pulposus appears to be the first site of degeneration with the annulus fibrosis being the primary pain generator once injury or degeneration occurs. DDD ultimately may progress to IDD. Occasionally, an acute HNP can herniate centrally and cause a myelopathy. This can manifest as hyperreflexia, positive pathologic reflexes (such as Babinski and Hoffman signs), and sphincter disturbances. If left untreated, the effects can be irreversible. HNP typically affects younger patients (ie, < 40 y). DDD, part of natural aging, typically affects older patients (ie, >40 y). Fardon DF, Milette PC. Nomenclature and classification of lumbar disc pathology. Recommendations of the Combined task Forces of the North American Spine Society, American Society of Spine Radiology, and American Society of Neuroradiology. Spine (Phila Pa 1976). 2001 Mar 1. 26(5):E93-E113. [Medline]. Carette S, Fehlings MG. Clinical practice. Cervical radiculopathy. N Engl J Med. 2005 Jul 28. 353(4):392-9. [Medline]. Tanaka Y, Kokubun S, Sato T, et al. Cervical roots as origin of pain in the neck or scapular regions. Spine. 2006 Aug 1. 31(17):E568-73. [Medline]. Baptiste DC, Fehlings MG. Pathophysiology of cervical myelopathy. Spine J. 2006 Nov-Dec. 6(6 Suppl):190S-197S. [Medline]. Miyazaki M, Hong SW, Yoon SH, et al. Reliability of a magnetic resonance imaging-based grading system for cervical intervertebral disc degeneration. J Spinal Disord Tech. 2008 Jun. 21(4):288-92. [Medline]. Shim JH, Park CK, Lee JH, Choi JW, Lee DC, Kim DH, et al. A comparison of angled sagittal MRI and conventional MRI in the diagnosis of herniated disc and stenosis in the cervical foramen. Eur Spine J. 2009 Mar 18. [Medline]. Derby R, Baker R, Dreyfuss P. Cervical radicular pain: transforaminal vs. interlaminar steroid injections. ISIS Scientific Newsletter: Current Concepts-SpineLine. 2005. 5(1):16-17. Galbraith JG, Butler JS, Dolan AM, O'Byrne JM. Operative outcomes for cervical myelopathy and radiculopathy. Adv Orthop. 2012. 2012:919153. [Medline]. [Full Text]. Bhadra AK, Raman AS, Casey AT, Crawford RJ. Single-level cervical radiculopathy: clinical outcome and cost-effectiveness of four techniques of anterior cervical discectomy and fusion and disc arthroplasty. Eur Spine J. 2009 Feb. 18(2):232-7. [Medline]. Bapat MR, Chaudhary K, Sharma A, et al. Surgical approach to cervical spondylotic myelopathy on the basis of radiological patterns of compression: prospective analysis of 129 cases. Eur Spine J. 2008 Dec. 17(12):1651-63. [Medline]. Pechlivanis I, Brenke C, Scholz M, et al. Treatment of degenerative cervical disc disease with uncoforaminotomy--intermediate clinical outcome. Minim Invasive Neurosurg. 2008 Aug. 51(4):211-7. [Medline]. Yan D, Li J, Zhu H, et al. Percutaneous cervical nucleoplasty and percutaneous cervical discectomy treatments of the contained cervical disc herniation. Arch Orthop Trauma Surg. 2010 Jan 8. [Medline]. King JT Jr, Abbed KM, Gould GC, et al. Cervical spine reoperation rates and hospital resource utilization after initial surgery for degenerative cervical spine disease in 12,338 patients in Washington State. Neurosurgery. 2009 Dec. 65(6):1011-22; discussion 1022-3. [Medline]. Denda H, Kimura S, Yamazaki A, et al. Clinical significance of cerebrospinal fluid nitric oxide concentrations in degenerative cervical and lumbar diseases. Eur Spine J. 2011 Apr. 20(4):604-11. [Medline]. [Full Text]. Fei Z, Fan C, Ngo S, Xu J, Wang J. Dynamic evaluation of cervical disc herniation using kinetic MRI. J Clin Neurosci. 2011 Feb. 18(2):232-6. [Medline]. Nam TW, Lee HS, Goh TS, Lee JS. Predictors of Motor Weakness and Delayed Recovery in Cervical Disk Herniation. J Spinal Disord Tech. 2015 Aug. 28 (7):E405-9. [Medline]. Shedid D, Benzel EC. Cervical spondylosis anatomy: pathophysiology and biomechanics. Neurosurgery. 2007 Jan. 60(1 Supp1 1):S7-13. [Medline]. Radhakrishnan K, Litchy WJ, O''Fallon WM, Kurland LT. Epidemiology of cervical radiculopathy. A population-based study from Rochester, Minnesota, 1976 through 1990. Brain. 1994 Apr. 117 ( Pt 2):325-35. [Medline]. Schoenfeld AJ, George AA, Bader JO, Caram PM Jr. Incidence and epidemiology of cervical radiculopathy in the United States military: 2000 to 2009. J Spinal Disord Tech. 2012 Feb. 25(1):17-22. [Medline]. Salemi G, Savettieri G, Meneghini F, et al. Prevalence of cervical spondylotic radiculopathy: a door-to-door survey in a Sicilian municipality. Acta Neurol Scand. 1996 Feb-Mar. 93(2-3):184-8. [Medline]. Kelley LA. In neck to neck competition are women more fragile?. Clin Orthop. 2000 Mar. (372):123-30. [Medline]. Marchiori DM, Henderson CN. A cross-sectional study correlating cervical radiographic degenerative findings to pain and disability. Spine. 1996 Dec 1. 21(23):2747-51. [Medline]. Slipman CW, Plastaras C, Patel R, et al. Provocative cervical discography symptom mapping. Spine J. 2005 Jul-Aug. 5(4):381-8. [Medline]. Yates JP, McGill SM. The effect of vibration and posture on the progression of intervertebral disc herniation. Spine (Phila Pa 1976). 2011 Mar 1. 36(5):386-92. [Medline]. Malanga GA, Landes P, Nadler SF. Provocative tests in cervical spine examination: historical basis and scientific analyses. Pain Physician. 2003 Apr. 6(2):199-205. [Medline]. Boden SD, McCowin PR, Davis DO, et al. Abnormal magnetic-resonance scans of the cervical spine in asymptomatic subjects. A prospective investigation. J Bone Joint Surg Am. 1990 Sep. 72(8):1178-84. [Medline]. Kuijper B, Tans JT, van der Kallen BF, Nollet F, Lycklama A Nijeholt GJ, de Visser M. Root compression on MRI compared with clinical findings in patients with recent onset cervical radiculopathy. J Neurol Neurosurg Psychiatry. 2011 May. 82(5):561-3. [Medline]. Michelini G, Corridore A, Torlone S, et al. 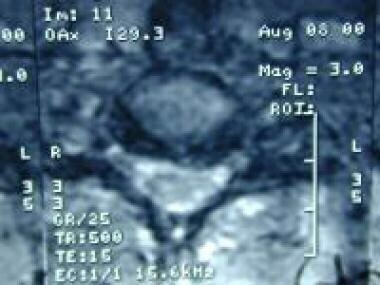 Dynamic MRI in the evaluation of the spine: state of the art. Acta Biomed. 2018 Jan 19. 89 (1-S):89-101. [Medline]. Manchikanti L, Dunbar EE, Wargo BW, Shah RV, Derby R, Cohen SP. Systematic review of cervical discography as a diagnostic test for chronic spinal pain. Pain Physician. 2009 Mar-Apr. 12(2):305-21. [Medline]. Dillingham TR, Lauder TD, Andary M, et al. Identification of cervical radiculopathies: optimizing the electromyographic screen. Am J Phys Med Rehabil. 2001 Feb. 80(2):84-91. [Medline]. Sugawara T. Anterior Cervical Spine Surgery for Degenerative Disease: A Review. Neurol Med Chir (Tokyo). 2015. 55 (7):540-6. [Medline]. [Full Text]. Fay LY, Huang WC, Wu JC, et al. Arthroplasty for cervical spondylotic myelopathy: similar results to patients with only radiculopathy at 3 years' follow-up. J Neurosurg Spine. 2014 Sep. 21(3):400-10. [Medline]. Radcliff K, Coric D, Albert T. Five-year clinical results of cervical total disc replacement compared with anterior discectomy and fusion for treatment of 2-level symptomatic degenerative disc disease: a prospective, randomized, controlled, multicenter investigational device exemption clinical trial. J Neurosurg Spine. 2016 Aug. 25 (2):213-24. [Medline]. Pandey PK, Pawar I, Gupta J, Verma RR. Comparison of Outcomes of Single-Level Anterior Cervical Discectomy With Fusion and Single-Level Artificial Cervical Disc Replacement for Single-Level Cervical Degenerative Disc Disease. Spine (Phila Pa 1976). 2017 Jan 1. 42 (1):E41-9. [Medline]. Luo J, Gong M, Huang S, et al. Incidence of adjacent segment degeneration in cervical disc arthroplasty versus anterior cervical decompression and fusion meta-analysis of prospective studies. Arch Orthop Trauma Surg. 2015 Feb. 135(2):155-60. [Medline]. Delamarter RB, Zigler J. Five-year Reoperation Rates, Cervical Total Disc Replacement versus Fusion, Results of a Prospective Randomized Clinical Trial. Spine (Phila Pa 1976). 2012 Nov 2. [Medline]. Jackson R, Johnson DE. 159 Neurological Outcomes of Two-Level Total Disk Replacement Versus Anterior Discectomy and Fusion: 7-Year Results From a Prospective, Randomized, Multicenter Trial. Neurosurgery. 2016 Aug. 63 Suppl 1:164. [Medline]. Salari B, McAfee PC. Cervical total disk replacement: complications and avoidance. Orthop Clin North Am. 2012 Jan. 43(1):97-107, ix. [Medline]. Denaro V, Di Martino A. Cervical spine surgery: an historical perspective. Clin Orthop Relat Res. 2011 Mar. 469(3):639-48. [Medline]. [Full Text]. Gebremariam L, Koes BW, Peul WC, Huisstede BM. Evaluation of treatment effectiveness for the herniated cervical disc: a systematic review. Spine (Phila Pa 1976). 2012 Jan 15. 37(2):E109-18. [Medline]. Anderson PA, Subach BR, Riew KD. Predictors of outcome after anterior cervical discectomy and fusion: a multivariate analysis. Spine. 2009 Jan 15. 34(2):161-6. [Medline]. Joaquim AF, Riew KD. Multilevel cervical arthroplasty: current evidence. A systematic review. Neurosurg Focus. 2017 Feb. 42 (2):E4. [Medline]. [Full Text]. Laratta JL, Shillingford JN, Saifi C, Riew KD. Cervical Disc Arthroplasty: A Comprehensive Review of Single-Level, Multilevel, and Hybrid Procedures. Global Spine J. 2018 Feb. 8 (1):78-83. [Medline]. [Full Text]. Hu Y, Lv G, Ren S, Johansen D. Mid- to Long-Term Outcomes of Cervical Disc Arthroplasty versus Anterior Cervical Discectomy and Fusion for Treatment of Symptomatic Cervical Disc Disease: A Systematic Review and Meta-Analysis of Eight Prospective Randomized Controlled Trials. PLoS One. 2016. 11 (2):e0149312. [Medline]. [Full Text]. Wullems JA, Halim W, van der Weegen W. Current evidence of percutaneous nucleoplasty for the cervical herniated disk: a systematic review. Pain Pract. 2014 Jul. 14(6):559-69. [Medline]. Hodges SD, Castleberg RL, Miller T, et al. Cervical epidural steroid injection with intrinsic spinal cord damage. Two case reports. Spine. 1998 Oct 1. 23(19):2137-42; discussion 2141-2. [Medline]. Furman MB, Giovanniello MT, O''Brien EM. Incidence of intravascular penetration in transforaminal cervical epidural steroid injections. Spine. 2003 Jan 1. 28(1):21-5. [Medline]. Brouwers PJ, Kottink EJ, Simon MA, et al. A cervical anterior spinal artery syndrome after diagnostic blockade of the right C6-nerve root. Pain. 2001 Apr. 91(3):397-9. [Medline]. Baker R, Dreyfuss P, Mercer S, et al. Cervical transforaminal injection of corticosteroids into a radicular artery: a possible mechanism for spinal cord injury. Pain. 2003 May. 103(1-2):211-5. [Medline]. Zhang Y, Chee A, Thonar EJ, An HS. Intervertebral disk repair by protein, gene, or cell injection: a framework for rehabilitation-focused biologics in the spine. PM R. 2011 Jun. 3(6 Suppl 1):S88-94. [Medline]. Drazin D, Rosner J, Avalos P, Acosta F. Stem cell therapy for degenerative disc disease. Adv Orthop. 2012. 2012:961052. [Medline]. [Full Text]. DePalma M. Biologic Treatments for Discogenic Low Back Pain. SpineLine. 2012 Mar-Apr. 3:19-26. Green C, Butler J, Eustace S, Poynton A, O'Byrne JM. Imaging modalities for cervical spondylotic stenosis and myelopathy. Adv Orthop. 2012. 2012:908324. [Medline]. [Full Text]. Grasso G. Clinical and radiological features of hybrid surgery in multilevel cervical degenerative disc disease. Eur Spine J. 2015 Nov. 24 Suppl 7:842-8. [Medline]. Cole T, Veeravagu A, Zhang M, Azad TD, Desai A, Ratliff JK. Anterior Versus Posterior Approach for Multilevel Degenerative Cervical Disease: A Retrospective Propensity Score-Matched Study of the MarketScan Database. Spine (Phila Pa 1976). 2015 Jul 1. 40 (13):1033-8. [Medline]. Right C7 cervical transforaminal epidural steroid injection demonstrating epidural and radicular spread of radiologic contrast dye. Cervical epidural steroid injection at the C7-T1 interlaminar space. Cervical discography. Anteroposterior fluoroscopic image. Cervical discography. Lateral fluoroscopic image. Disclosure: Serve(d) as a director, officer, partner, employee, advisor, consultant or trustee for: OSS Health<br/>Serve(d) as a speaker or a member of a speakers bureau for: Spine Intervention Society; North American Spine Society<br/>Received research grant from: Mesoblast/ Cascade<br/>Received income in an amount equal to or greater than $250 from: Elsevier (Royalties). Disclosure: Received consulting fee from St. Jude's Medical for speaking and teaching; Received consulting fee from Joimax for speaking and teaching.